They’ve got a new challenge going on at Let’s Get Shabby. This time it’s a color challenge. Here is a peek at our inspiration picture. 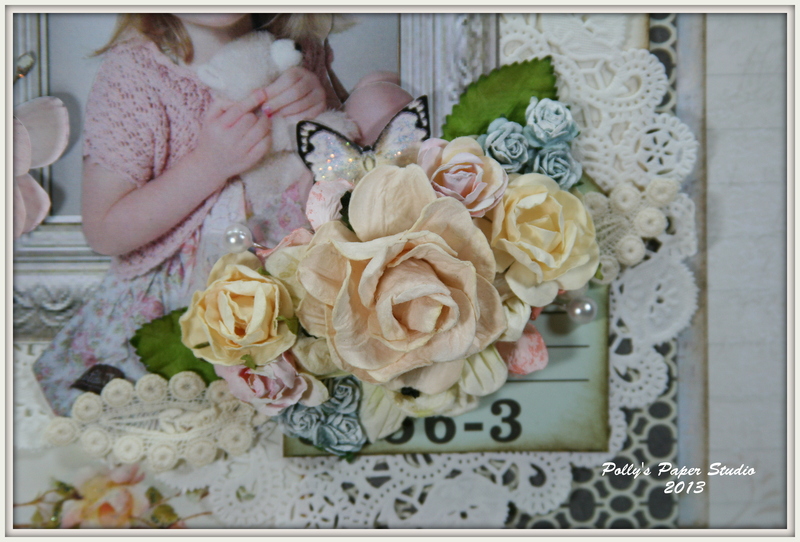 For this challenge we were asked to use all the colors….which I just loved…so soft and shabby. Here is my project….a layout of my Niece Olivia. 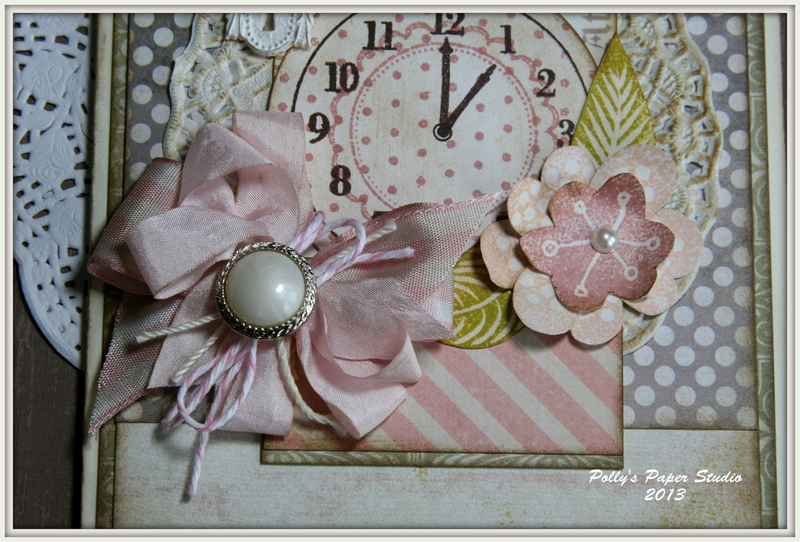 I dry brushed these flowers to coordinate with the shabby color challenge, then layered them over a great little mailing tag, pretty pearly stick pins, bits of lace and pretty doily donated by my dear sweet friend Anna. Another grouping of flowers to anchor the other corner. 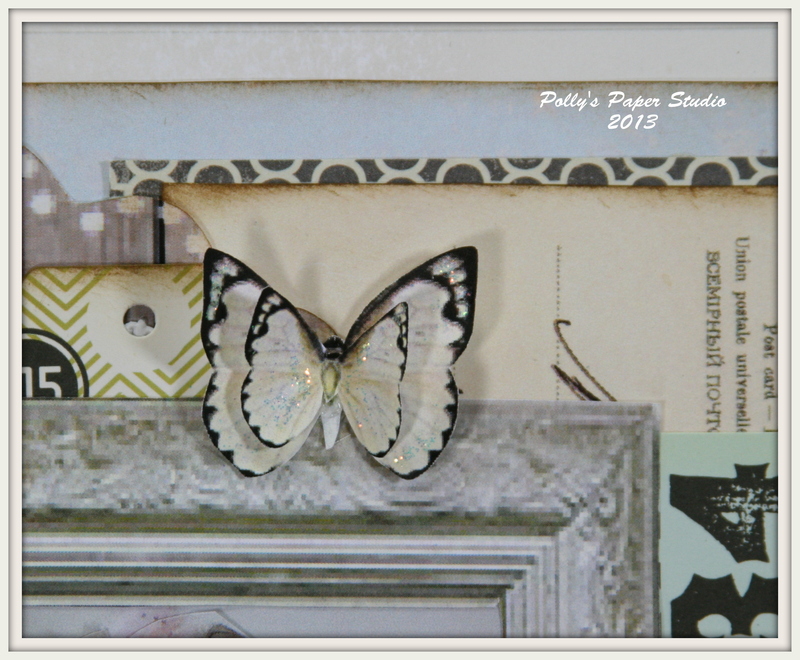 Here is a lovely layered and Stickled butterfly. 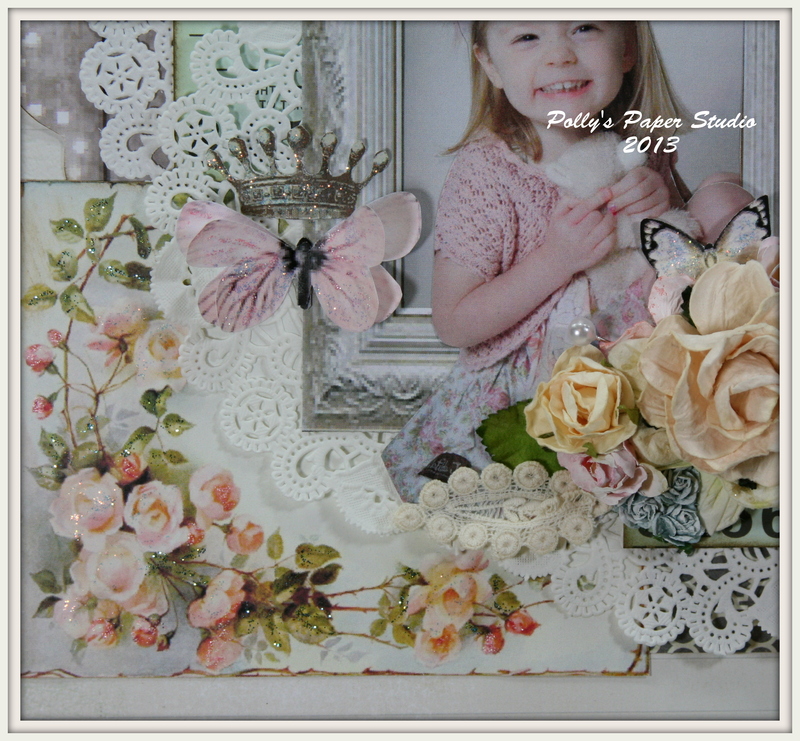 I added lot’s of Stickles to this pretty vintage printout….and to the crown and butterfly. The glitter is a nice finishing touch! Okay…now it’s your turn to create a project for the color challenge…click on the link above for the rules and good luck to all who enter. I spent a good amount of time yesterday fiddling with this card. I had all the pieces I thought I wanted to use….and no matter how I tried…I just could not make it work! Super frustrating. Have you had days like that too? I’m sure we all do. You forget how to smart. Once I was good and fed up…I took all the little pieces off the top and discovered underneath…that I actually did like the base layers quite a lot….so I got out some new goodies for the top….and voila a finished card that I just love!!! Moral of the story????? Sometime you just have to stop and find a new solution when you’re stuck on a project! My girlies Anna and Brandy who were visiting me in the shop will be laughing…this is not the card I set out to make. It’s only like a million times better : ) Don’t ya just love that paper??? It’s Pink Paislee. That double chevron is so pretty. The printed die cuts are too. They’re from different lines…but you know me..I’ve got to mix and match. This perfect little bow was tied with Taupe Chevron from Really Reasonable Ribbon. 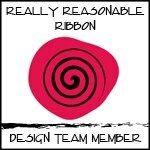 Bonnie is starting a new challenge over at Really Reasonable Ribbon’s Ramblings. Red White and Blue is the theme this time…how perfect as I know we are all gearing up for our summer holidays and won’t it be lovely to add some handcrafted items to our seasonal decor? I’ve created this very festive card….it may be a little over the top…but then again…why not celebrate in style??? Once I got to layering…it was hard to stop lol. 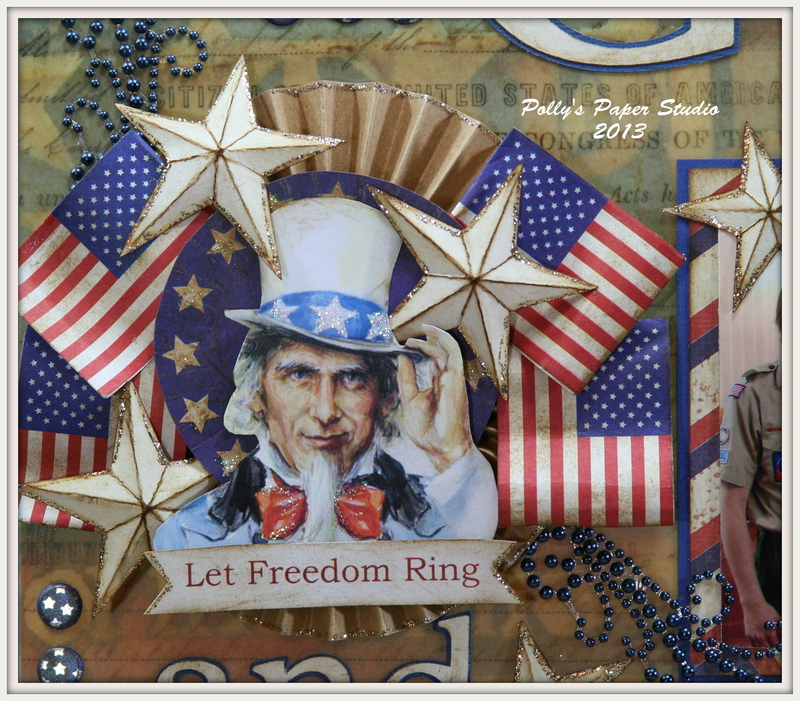 I have these fun papers in stock and also some fabulous sticker sheets in the shop and on sale….so if your in the area….stop in and say hello and pick up some patriotic crafting goodies. To finish this card….I added a layer of burlap. And some patriotic hemp string. Okay….now it’s your turn to get you red white and blue on and enter the challenge at RRR. Okay Peeps…I’ve got our next class lined up : ) This time I got a great selection of variety cards.. One for Birthday, Thank You, Masculine, Patriotic and all occasion. That’s 5 cards….all vintagy, with lot’s and lot’s of layers : ) Some have buttons, Really Reasonable Ribbon trims, and of course beautiful vintage images! You can stop in the shop to check out the other cards and leave your deposit to save your seat. 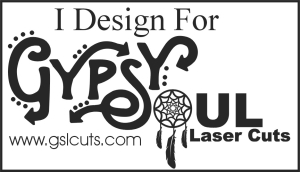 You can also call me up at the shop (734) 268-1109 to save your seat. Please do not leave deposit information in a message. 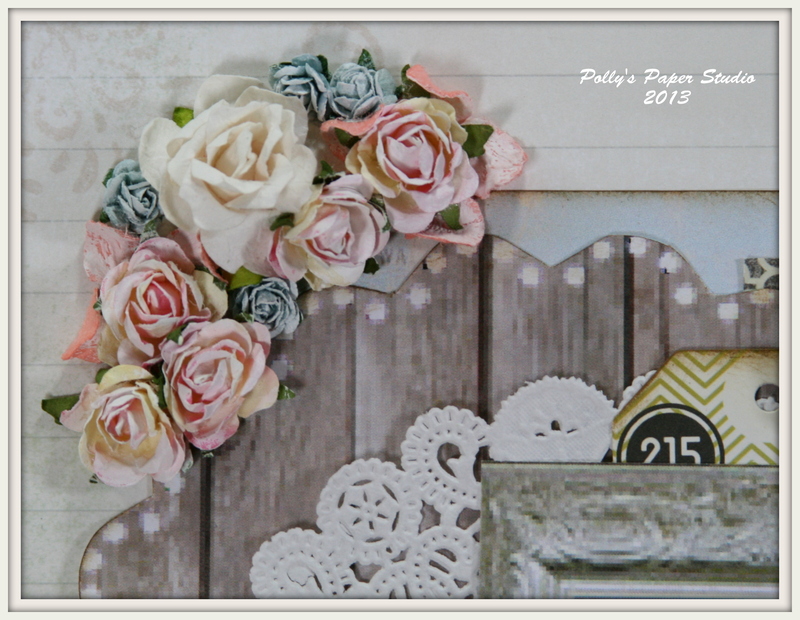 Despite the chilly weather outside…I’m told it’s Spring…and that must mean it’s time again for another Blog Hop with Really Reasonable Ribbon. 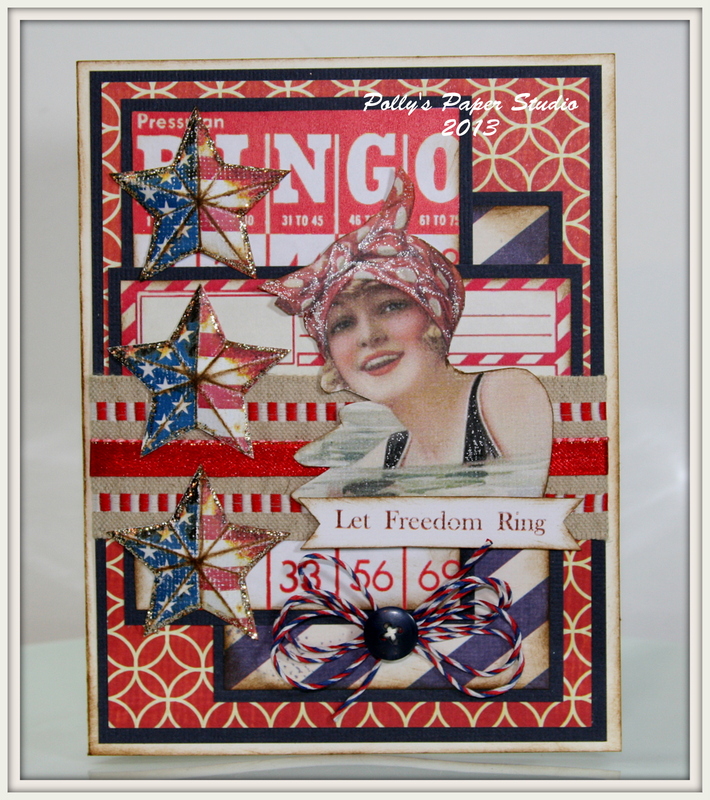 This month we’re sharing our projects made with the fabulous Patriotic Ribbon Club Assortment. This assortment is so great for me as the summer holidays are some of my favorite to celebrate since we are fiercely patriotic and the 4th of July is my Dear Hubbies Birthday…and very soon we will be celebrating our oldest Son’s Eagle Scout Ceremony and high school graduation. I created my project to use as part of the decoration at his banquet. I’ve gotten a sneaky peek at some of the other designers projects and I have to say…I love them all. Okay…let’s get hopping. You should be coming to Polly’s from the lovely and talented Misty. 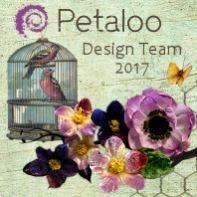 If you’re just starting here…..you need to click HERE to start at the beginning…then follow all the links to see the very inspiring projects created by the design team. Don’t forget to leave a little love for the fabulous projects! This pic is my Son with his patrol. Such wonderful, respectful, helpful, reverent, incredible young men. I am super proud of all of them : ) I always have a stash of great papers to create patriotic projects. 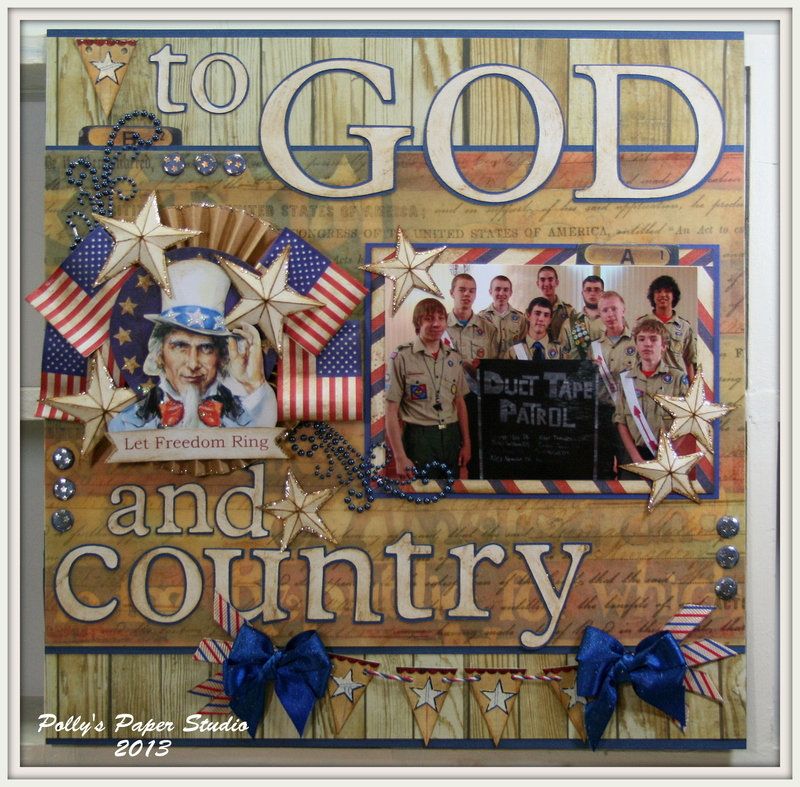 For this layout….I really wanted to add lot’s of dimensional embellishments….So I started with a very patterned paper….then chose to cover it with patterned velum to give me a neutral background….You can still see the flag through the velum which is printed with the Declaration. 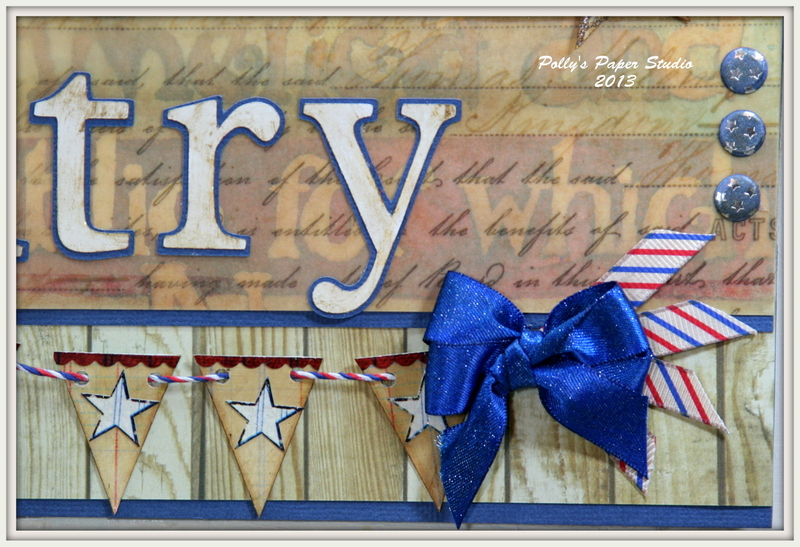 This fun banner was created by layering lot’s of well inked stickers…then punching tiny holes and string them between fabulous bows made from the ribbon assortment. I added a bit of extra inked trim to the outside…to bring the color down to the corner. 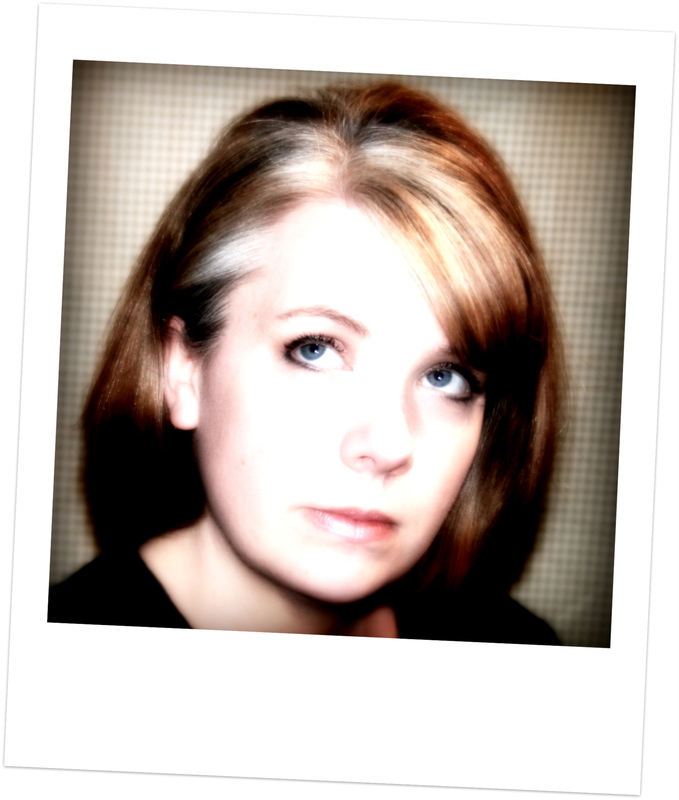 For this little number….I started with a base of a very large folded cardstock rosette. Then layered on great little flags on picks, part of a cupcake wrapper, vintage Uncle Sam image. Some folded dimensional stars with lot’s of ink and glitter and blue pearly flourishes. There is also a several Brittania Candi Dots. Your next stop in the hop is the wonderful GLORIA. Thanks for hopping along with us this month…I hope you enjoyed our projects as much as we enjoyed creating them! 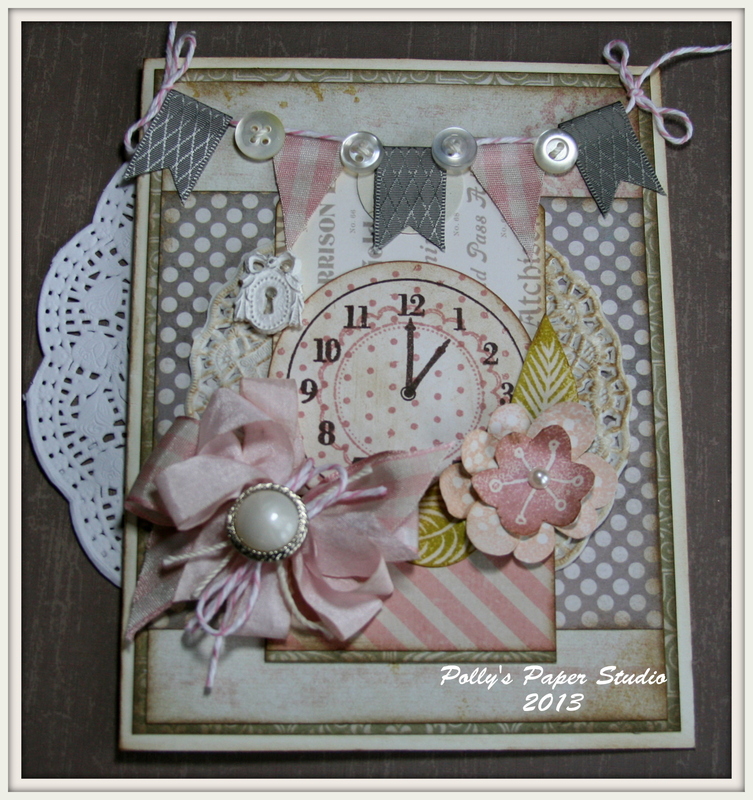 I’m just popping in to share a sweet little baby girl card I created yesterday. I’ve got this great new Pink Paislee paper win the shop with the best pink diagonal stripes : ) I did a little more stamping too…I must be on a roll lol….two cards in a row. The inspiration for this card was that little girl image…which I printed on textured cardstock to give an aged appearance…then clipped her from her background. I stamped the sentiment image then added Stickles to the frame for accent. The stickers are from a Simple Stories sticker sheet. I added the clip and vintage button to finish. The bow is made from RRR Wrinkle Ribbon. Not sure if this card is going to stay a card….or perhaps I will use it as a cover for a baby girl mini album. It is odd for me to find myself stamping….not that I don’t enjoy it….but I just don’t do it often. We all have our certain techniques we gravitate toward right??? Like I am not for the embossing. Weird….Maybe because there are too many patterned papers I want to use. Anyhoo…I have A LOT OF STAMPS for someone who does not stamp often…so I’ve made it my goal to use them more. The stamped element is the clock in the middle. 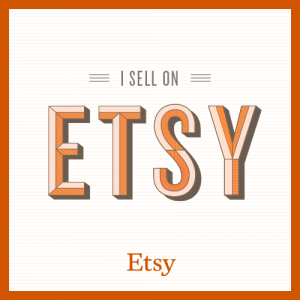 I started with my Peachy Keen Polka Dot Background stamp…and added the pink dots…then added a scalloped center working in the pink still. Then switched to chocolate brown and added the clock face and hands. Then I used my 2 1/2 inch circle punch and cropped it out…then I gave the whole thing a good working over with Gathered Twig Distress Ink paying particular attention to the edge. I kinda love how it turned out : ) the flowers are stamped and trimmed and inked and layered…then topped off with pretty pearly accent. Poofy bow of Pink Wrinkle Ribbon and Pink Gingham, topped of with Bakers Twine and vintage button. 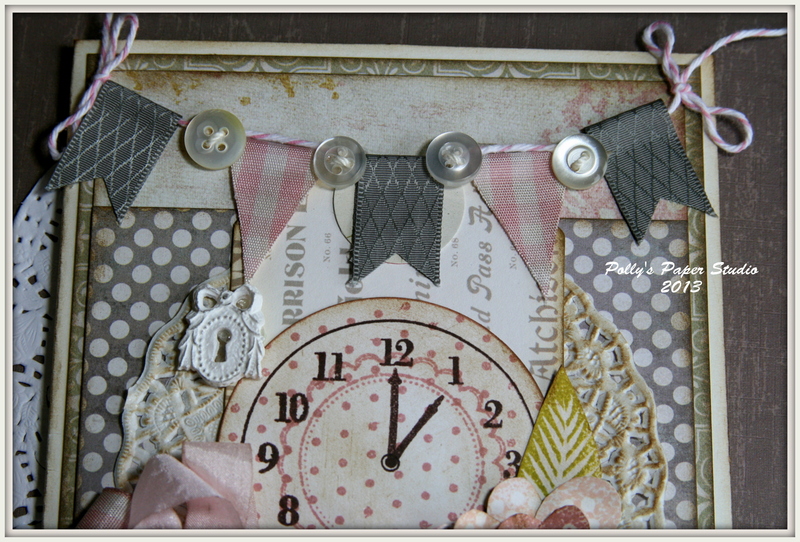 Ribbon banner with more buttons, inked doily and typography tag and resin lock plate. That’s it for stamped project #1…..I’ve got more tags ready to share on another day .